Wear the proper shoes. Diabetics are more prone to injure themselves without even knowing it due to neuropathy. Wearing the proper shoes will protect your feet thus reducing the likelihood of injury. Diabetic shoes are very common. They are wider, deeper, and more sturdy than other shoes. Extra width is important for allowing your toes to stay dry and not rub up against each other. Extra depth is important because you will probably require orthotics to adjust the way your foot hits the ground to avoid injury. The sturdy material is important for stability the foot and ankle as well as protecting the foot against injury. As neuropathy gets worse it is a common for a diabetic to want to squeeze into smaller shoes because they can’t feel the normal sized shoes anymore. This however will cause more damage to the foot over time. Always make sure that you are in the proper sized shoes to lessen the risk of an injury. Check your feet daily. Diabetics heal more slowly than they did before they were diagnosed. Even small cuts need to be properly addressed as soon as possible to avoid any potentially dangerous complications. When checking your feet make sure to look for: red spots, cuts, blisters, change in swelling, change in color, change in sensations, ingrown toenails, untrimmed toenails, corns, or calluses. You also want to make sure your feet are dry and clean. Proper socks and shoes will help you keep your feet drier. If you are unable to do so yourself, your healthcare provider will be able to trim any nails, corns, or calluses that you may have. Have your feet checked by a professional. Every time you are seen by your physician, they should check your feet. If they are not already doing so, please say something, and they will be more than happy to make sure your feet are healthy. In addition to your normal visits, it is also important that you see a podiatrist at least once a year. The podiatrist will evaluate any nerve damage, any wounds, and your gait. If an orthotic is necessary to adjust the way you are walking they will be able to get you set up with the correct one. If you are not walking correctly, the chances of forming an ulcer that will need attention increase dramatically. Keep the blood flowing. Proper blood circulation will help to keep your feet healthy. If you have circulation problems, consider using compression stockings to force the blood out of your legs and back into the body. There are also many things you can do while sitting down to improve circulation. First try to elevate your feet when you are sitting. Also move your toes around and move your ankles up and down every once in awhile. Yacon syrup is a natural sweetener that is made from the yacon root which grows in the Andes Mountains. It is made with an evaporator similar to the way that maple syrup is made. It is similar to the taste and consistency of molasses. Yacon syrup has about half the calories of sugar and will not cause a spike in blood glucose levels. For years Bolivians have eaten yacon root and drank tea made from its leaves. 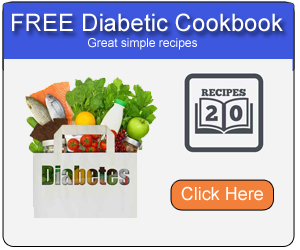 They believe it to be not only an antidiabetic but also helpful for many other health conditions. Diabetics need to discuss with their doctor whether or not adding yacon syrup to their daily routine is advisable. Yacon syrup is known to lower blood glucose levels. It is no longer advisable to drink the tea because it has been shown to damage the kidneys, thus lowering insulin levels. 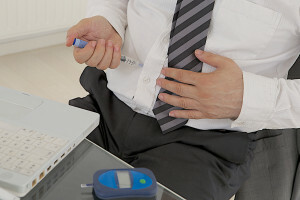 If you are a diabetic and taking medication that lowers blood glucose levels, the combination of the two could lead to potentially dangerous hypoglycemia or insulin shock. 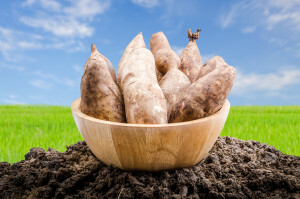 Yacon syrup lowers blood glucose levels by lowering glucose production in the liver, lowering fasting glucose rates, and increasing insulin sensitivity. The effects yacon syrup has on the kidneys has not been extensively studied. Several studies that have shown yacon syrup is a great tool for fat and weight loss in people who are overweight. Yacon syrup contains about half the fructooligosaccharides (FOS) needed for healthy living. FOS have many potential beneficial effects. They are a prebiotic that helps maintain a healthy gut flora. FOS also act as a soluble fiber, when they come into contact with gastric fluids, they expand in size. This transmits a signal to the brain telling it that your stomach is full. This will allow you to eat less and feel fuller longer. FOS are also a powerful metabolic booster, they allow you to burn calories faster and completely. This is what allows the fat to seemingly melt away if you take yacon syrup daily. Taking a spoonful of yacon syrup 2-4 times a day before you eat a meal is generally recommended. This will allow you to eat less and lose weight. Many people have touted this as a miracle diet that needs no change to your daily habits. You might see moderate fat and weight loss by doing nothing extra, but many studies have shown that making some changes are in your best interests. If you increase your exercise, even to a minimum, and decrease your caloric intake, you should start seeing results in no time! Millions of people have diabetes. Finding a balance between having a career and managing diabetes is possible with a little planning. You don’t have to give up on a career just because you have diabetes. Your employer must make reasonable accommodations for your disability. Here are a few tips on how to streamline your blood glucose management and your career. Never skip breakfast. As a diabetic, breakfast really is the most important meal of the day. A healthy breakfast will not only help you have proper blood glucose management, but it will also ensure a higher level of performance on the job. Make a meal plan ahead of time. Whether you are bringing snacks and meals from home or you are going to get food while you are at work, it is important that you have a plan for the day. Plan in advance what times you need to eat and what you plan to eat. Keeping a food journal handy can help you with this. If you know how your body will react to certain foods, you will be more capable of properly managing your blood glucose levels. Feel free to ask questions. Knowing what is in your food is very important. This will help you plan how much insulin you might need and how many calories you will be consuming. If you do not want to advertise that you have diabetes, you can always ask under the guise of having an allergy or trying to lose weight. Stay organized. Having your testing supplies and medication together will make testing and taking medication much more discreet and fast. Tell someone about your condition. You don’t have to tell everyone that you have diabetes, but at least tell someone who works closely with you about your condition. Explain to them the warning signs of hypoglycemia and what should be done in case of an emergency. You might not always notice the warning signs yourself, so having someone who might notice can prevent an emergency from occurring. Be prepared to discuss your diabetes with your boss. You employer is obligated to provide you with reasonable accommodations in regards to your disability. This includes allowing you breaks to test blood glucose levels, take medication, and to eat snacks or meals to ensure proper blood glucose management. If you need your employer to make an accommodation for you, it is important that you walk into the meeting with a can do attitude. Explain to them what you need, why you need it, and how having it will allow you to perform your job to the best of your abilities. Foods that are high in fat, sodium, sugar, carbohydrates, and calories increase your risk of high cholesterol, high blood pressure, heart disease, poor glucose control, and excessive weight gain. Here are five types of foods to avoid when you have diabetes. Sugary Foods – High sugar foods like sodas, cookies, candy, and cake are considered to be low-quality carbohydrates. They are lacking in nutritional value, can cause a spike in blood sugar, and can lead to weight gain. Sugar is also very addictive. It might seem impossible at first, but substituting fruits like apples, pears, berries, and oranges can satisfy your sweet tooth just as well. These foods are considered high-quality carbohydrates and contain fiber which slows down the absorption of glucose leading to better blood-sugar control. Fruit Juices – While fruit juices are generally considered more nutritious than sugary drinks and sodas, they should still be avoided by diabetics. One cup of apple juice contains 165 calories and 39 grams of sugar. This can lead to a dangerous spike in blood sugar levels. You are also missing out on fiber when you choose apple juice over a whole apple. White Rice, Bread, and Flour – As foods are processed and refined they lose their nutrients. White rice and foods made from white flour are considered low-quality carbohydrates. These carbohydrates break down quickly and raise blood sugar levels. Instead of processed rice and flour, choose brown or wild rice, barley, oats, and products made with whole grains. Full-Fat Dairy – A diet high in saturated fats can not only raise your “bad” (LDL) cholesterol, it can also increase your insulin resistance. Instead of eating full-fat milk, yogurt, cheese, or ice cream, look instead for fat-free or low-fat versions. Fatty Cuts of Meat– Fatty meats are also high in saturated fats. 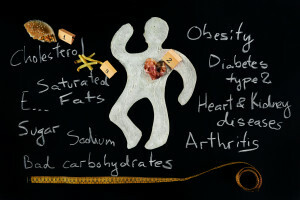 Saturated fats can increase your “bad” LDL cholesterol and put you at a greater risk for heart disease. They can also worsen inflammatory problems. Lean meats like, lean beef, pork tenderloin, fish, shellfish, and skinless poultry are much better options than fatty meats. Proper foot care is an essential part of diabetes management. Diabetic compression socks may be beneficial if you are suffering from nerve damage and/or inflammation. Diabetic compression socks, also known as medical stockings, are very tight and can help treat a variety of conditions including; swelling of the legs and feet, achy legs, spider veins, varicose veins, and the prevention of deep vein thrombosis (DVT). They are very tight around the ankles and gradually loosen up as they go up the leg. This forces unoxygenated blood back up the legs so it can be recirculated and reoxygenated. compression socks are measured in millimeters of mercury (mmHg), the same way blood pressure is measured. This measures the amount of pressure that is exerted by the sock on the foot. Typically the socks start around 18-25 mmHg and increase if your doctor thinks it is necessary. Diabetics with poor blood glucose control are more prone to developing venous insufficiency. Blood that is high in sugar is thicker and puts more pressure on the walls of the arteries. Over time the artery walls weaken and can become misshaped. This leads to poor blood circulation and can cause peripheral edema, a swelling of the feet, ankles, and legs. When using a diabetic compression sock, the arteries are compressed and forced to become more straight. This allows for better blood circulation and reduces the swelling. Diabetic compression socks also help reduce the risk of injuring the foot. They should be well padded and either be seamless or have a “flat seam” around the toes. They should not be confused with diabetic socks. Diabetic socks also reduce the risk of injury to the foot because they are padded, however, they do not offer any compression. If you are experiencing any swelling or pain in your legs you should talk with your doctor to see if diabetic compression socks could be beneficial to you. 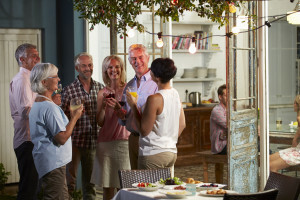 Understanding the effects of alcohol and diabetes is an important part of proper diabetes management. Alcohol impacts how the liver regulates blood sugar, certain diabetes medications, and your ability to recognize hypoglycemia. Never drink on an empty stomach. Food slows the absorption of alcohol into the stomach. Eat a meal that has carbohydrates in it before drinking and always carry a carbohydrate snack in case your blood glucose level drops. Test your blood glucose level more often. 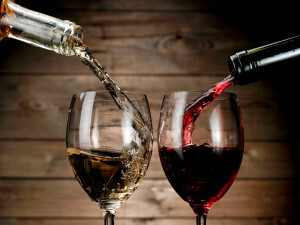 Alcohol masks the symptoms of hypoglycemia, testing more often will afford you better blood sugar control. Drink in moderation. 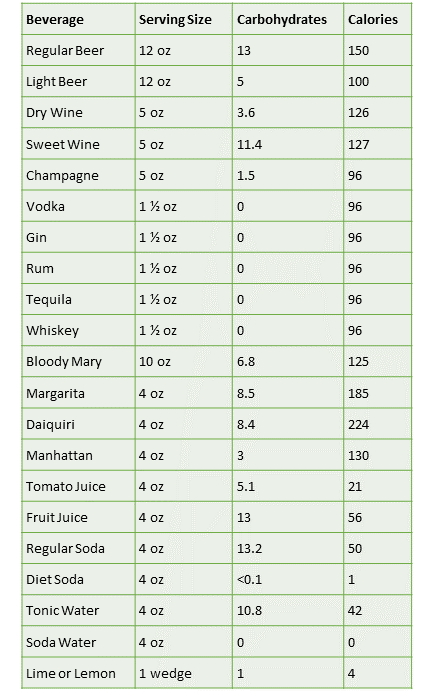 A diabetic should consume no more than 2 alcoholic drinks a day for men and 1 alcoholic drink per day for women. Give your liver a break. The liver releases glucose to maintain blood sugar levels. If it is busy breaking alcohol down it will do a poor job of releasing glucose. It takes from 1 – 1½ hours for the liver to break down 1 alcoholic drink. If you drink two drinks, for example, the amount of time it takes before your liver can focus on proper blood glucose management doubles to 2 – 3 hours putting you at risk for hypoglycemia longer. 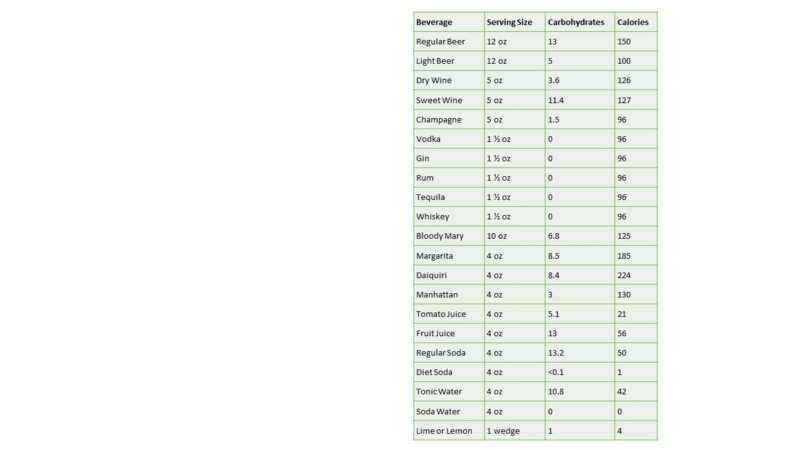 Below is a table of what would be considered one drink, the average carbohydrates, and the average calories for each beverage. Leptin is a hormone produced by the body’s fat cells. The more fat cells, the more leptin is produced. The main function of leptin is the long-term regulation of energy. It does this by telling us that we are either have enough fat stored, do not need to eat, and can burn calories at a normal rate. Or it tells us we are starving and we need to at more. It does this by communicating with the hypothalamus in the brain. Proper energy regulation keeps us from both starvation and overeating. Leptin resistance is thought to be the main biological abnormality in obesity. Obese people have more fat cells in their body, because of that, they also produce higher levels of leptin. These higher levels of leptin should tell our bodies that we do not need to eat. They also damage the leptin sensors in our body. If the brain is not able to detect the higher levels of leptin, it will wrongly believe that we must eat, and that we need to conserve energy. This starts a spiral effect as far as weight gain is concerned. You are overweight, your body tells you to eat and rest, you gain more weight, and the cycle continues. Unfortunately people who have leptin resistance and are overweight will fail more often than they will succeed at losing weight. Dieting and losing a significant amount of weight, often leads to “yo-yo” dieting. You lose a lot of weight just to gain it back later. 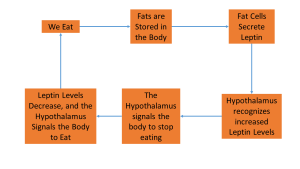 When we lose a significant amount of fat tissue your leptin levels decrease naturally. 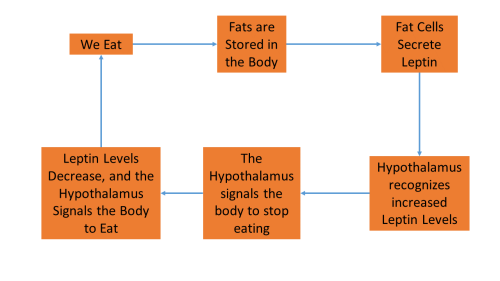 This signals the brain that we are starving and we must gain the lost weight back. Just look at yourself in the mirror, if you have a significant amount of fat, especially in the belly area, you are probably leptin resistant. Avoid processed foods. Processed foods are stripped of their nutritional value as they are processed. They are harder to digest and may compromise the integrity of the gut. Exercise more often. Even if your body is telling you to sit on the couch, it is imperative that you exercise. This will increase your weight loss and improve your overall day to day life. Eat more fiber. Soluble fiber is a key part of improving gut health and digestion. Eat more protein. Protein will help improve your leptin sensitivity, thus leaving you feeling fuller longer. Lower your carbohydrate intake. Eating less carbs will lower your triglycerides. High levels of triglycerides can prevent the transport of leptin to the brain. Sleep well. Getting enough quality sleep will help to reduce your leptin resistance. Losing weight and keeping it off can seem impossible. Keep in mind that there are serious biochemical forces at play. Understanding important factors like leptin resistance, proper diet, proper sleeping habits, and exercise will help you to get on the right track to be able to lose the weight and keep it off. Diabetic complications are more likely to affect us as we age. With proper diabetes care, diet, and exercise, those complications can be lessened. High levels of blood glucose can contribute to aging. When glucose and proteins bind together throughout the body, a byproduct called advanced glycosylation endproducts (AGEs) is left behind. AGEs do not break down and accumulate throughout the body. AGEs combine with other molecules and change the nature of the body’s cells, tissues, and blood vessels. This makes them become stiff and dysfunctional. It is thought that AGEs contribute to a number of diabetes related complications, such as; arthritis, diabetic eye disease, diabetic nerve disease, diabetic kidney disease, and cardiovascular disease. There are many medications that may interact with diabetes and cause hypoglycemia. Typically older people are on a number of medications, so it is important to talk to your doctor and pharmacist to make sure that you are not on a medication that will cause hypoglycemia. Attention declines with age. Counting carbohydrates, meal planning, blood glucose monitoring, and determining correct insulin doses all become more difficult with age, making diabetes management more difficult. As liver and kidney function decline, the rate that certain diabetes medications metabolize can slow down. This makes a perfect storm for hypoglycemia. There are several things you can do in order to counteract the effects of aging beyond regular checkups and knowing your medications. Controlling blood glucose levels will decrease the risk of developing diabetes related complications. Controlling blood pressure and cholesterol levels can help prevent atherosclerosis, a hardening of the arteries, which contributes to heart disease, stroke, weight gain, and osteoarthritis. Staying physically active is very important. Many of the problems such as slower metabolism and the inability to absorb oxygen are directly related to loss of muscle. Aerobic exercise and strength training will not only help in these areas, it will also make your day to day activities easier. Remember, you are never too old to start exercising, just make sure you discuss it with your doctor first. Get a good night’s sleep. Not getting enough sleep directly affects physical and mental health and can lead to heart disease.